Mix cocoa and cornflour in ¼ cup milk in a small bowl to a paste. Boil the rest of the milk with sugar in a heavy bottomed pan. Add cocoa and cornflour paste to the boiling milk, stirring continuously. Add grated chocolate. Cook on low heat for 3-4 minutes till chocolate dissolves. Add coffee and remove from fire. Put ¼ cup water in a small pan. Add gelatin. Dissolve on low heat. (For china grass mix it with 1 cup water and heat till it dissolves). Mix gelatin solution with the chocolate custard. Chill in the freezer for about 20 minutes till a little thick but not set. 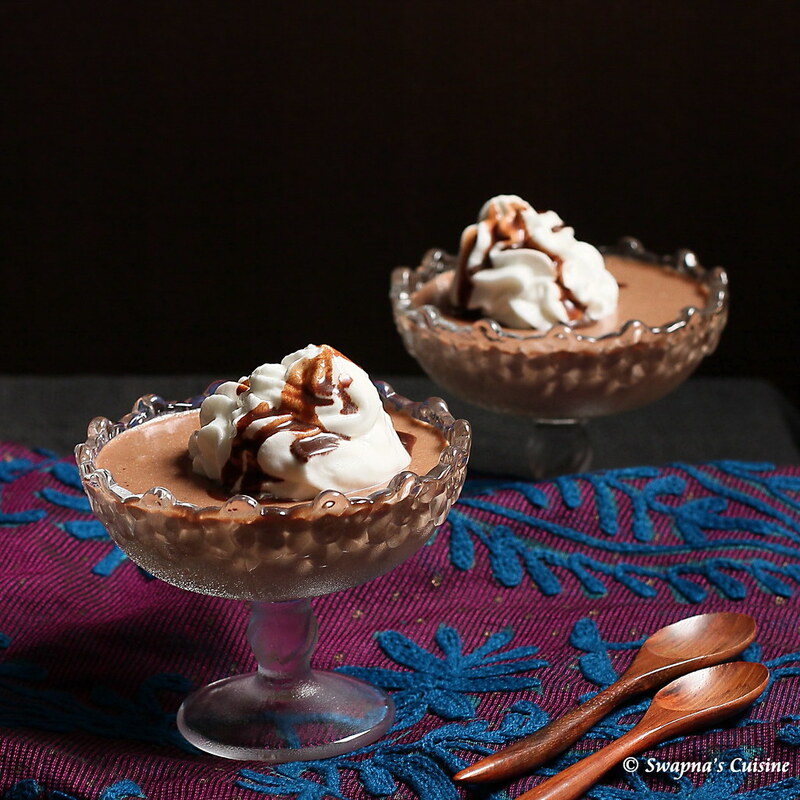 Beat the thickened chocolate custard. Beat cream and essence till slightly thick and fluffy. Add whipped cream to chocolate mixture. Mix gently. Transfer the mixture in to the serving dish or individual cups. Refrigerate for 3-4 hours or till set. Decorate with whipped cream or chocolate sprinklers. Did You Enjoy this Recipe? Looks very yummy! I love your clicks. The mousse is very tasty but can be had in only small quantity right? I had made some for my son's bday in small cups as dessert. Elegant dessert, love to finish those bowl pretty looking glasses of mousse. Great clicks. Chocolate is divine in any form!!!! That chocolate mousse looks amazing.. So yumm!! lovely clicks.. and the mousse is eggless... definately worth trying ..
Hi Swapna... Awesome blog! Got one doubt abt this recipe. If we are using china grass dissolved in 1 cup of water, won't that alter the conistency as opposed to the quarter cup water and gelatin? Got a question... If we are using chinagrass dissolved in one cup water, won't that alter the consistency as opposed to quarter cup water and gelatin? Hi, it looks great! Do these have to be set in the serving bowls during refrigeration? Could I not keep them in a big bowl and transfer contents later onto serving bowls? hey, i love the recipe! always wanted eggless chocolate recipe. i've one doubt about the ingredients. you have mentioned 1cup cream but is it amul fresh cream or whip cream? please reply asap! 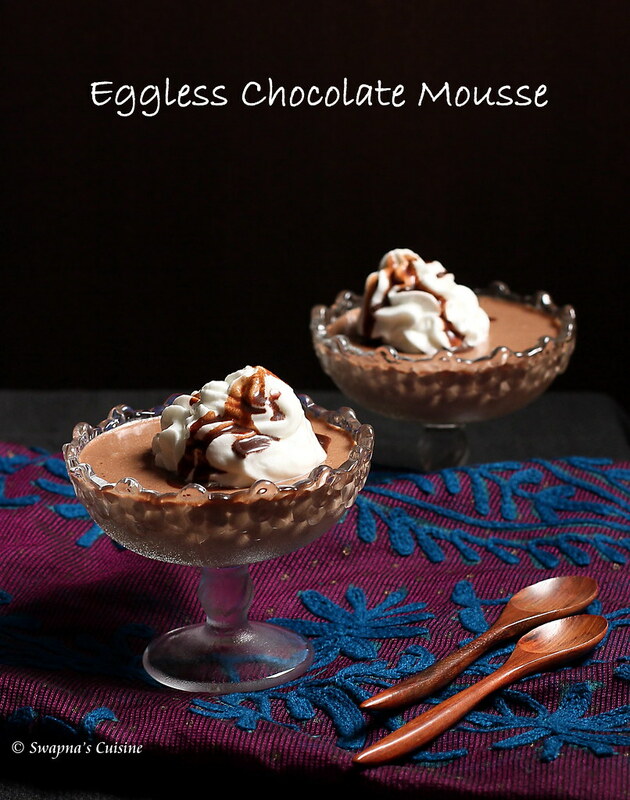 hi, i always wanted eggless mousse's recipe. thanks for the recipe :D i have one doubt about the ingredients. you have mentioned 1cup cream but is it amul fresh cream or whip cream?? please reply asap. Hi... 1 cup whipped cream with or without beating? Thank you for taking the time to visit my blog:) Your feedback is important....so feel free to post your comments and questions. Hope to see you soon!